A few years ago I created Jewelry for Isaac Bonewits. 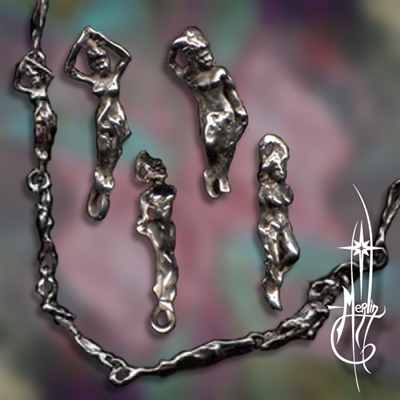 He created renderings of several designs and sent them to me to create for his special line of Jewelry. One of them is the Spells for Democracy Amulet. Isaac was very concerned for our nation as he had often spent a great deal of time discussing, lecturing and writing about the subject. After I had created several pieces for him I suggested he continue with his designs; thus he turned to develop a design developed to focus intent to a good aim: righting the wrong of our society. He wrote extensively about this subject, calling for the Pagan community to become more active, participating in the great debate for equality, justice and a better world. More about Isaac may be found here. 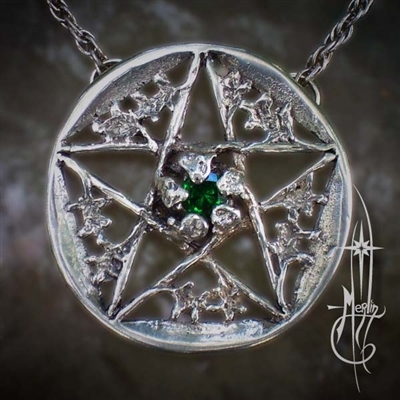 The pentacle is a classic symbol of Neo-Paganism. It is crossed with a Besom (broom) which symbolizes a great many things: here it is to represent the modern day Pagans and their efforts to create a better world. The Wampum (the staff with the disk) represents a symbol of the Iroquois: a composite of Native American tribes who formed a Democracy before the United States formed their own nation. Through his travels Isaac presented these amulets with his books and other items; he even created a special portion of his website to feature the work. 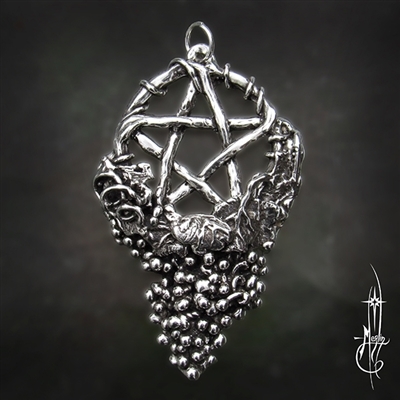 You may purchase these amulets through my site. Each piece purchased Isaac’s Household receives a royalty to both help recover from the debt of his passing and to extend his legacy promoting good will, democracy and clarity to the world. To learn about Isaac Bonewits, his writings and more, you may visit his website. To purchase the Spells for Democracy, please go Spells for Democracy Page. I wanted to expand the motif to a necklace. each holding loops at each end to be joined into a chain. laying down the links and seeing what was being suggested. I simply took up wax and carved her. I also experimented with earrings and bracelets with the flame chain. Each time I worked with the links they suggested even more ideas. thus the Pixie Flame Chain was born. sizzling and extruding from fire. something that the “jewelry industry” frowns upon. and in the case of my Mother: artist. was “what ever works: works”. there are times when the wave of inspiration catches you and you ride it until you are done. It is often so with sculpting. One learns to “think with your hands” in the creation of art. will then yield new and interesting ways to develop design. develop new ideas that would not occur to me otherwise. I listen to music and stories while I sculpt; I play the piano to think about shapes. while I go for a walk or talk to a friend. sounds from inspiration that in turn inspire. and looking into the future. of beginnings both abstract and concrete. with vitality and the promise of success. available as a brooch or necklace. completing the motif of fire and renewal. or simply taking a new look to life and the possibilities it holds. a design that they have worked up or seen in a dream. or perhaps sent in the regular mail. Not so with this particular piece. a tree, a star and the image of a God and Goddess. and wanted to be able to wear it on special occasions. “Just make the piece and I am sure that I will like it” he told me. The amulet you see here is the creation he requested. 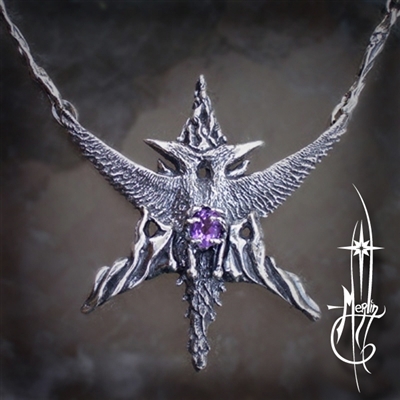 The God and Goddess Amulet is a one of a kind piece in sterling silver with rough quartz at its heart. all elements in health and harmony. If you are interested in learning more about having something made especially for you. 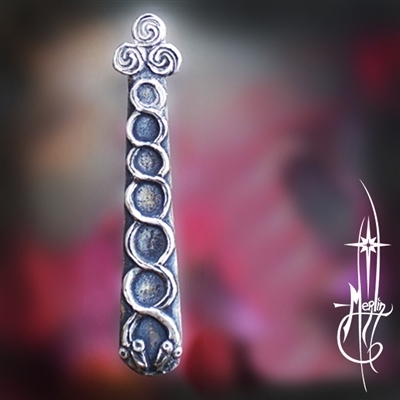 but were magical talismans inscribed with any symbol or character. 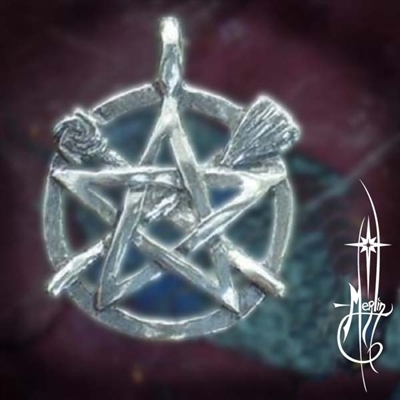 The most common “pentacle” is the five point star. the “First Man” in the Garden of Eden. to signify Matter or the Material World. the elements are over powering the spirit. the “ups and downs” of one’s existence. brotherhood, environment, healing, friendship and love. 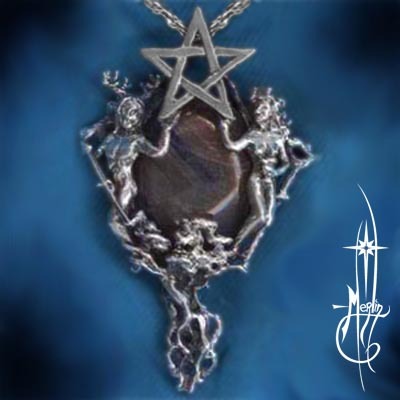 moonstone, caldrons, a pin design for wiccan clergy in the military and much more. I can create your design by way of your drawing or description. for his special line of Jewelry. One of them is Dagda’s Club. “Show your devotion to the manliest god of them all: the All Father, the Good (at everything) God, the fabulous Dagda! “Fiery father of the Gods of Erin, the Dagda is the Supreme Druid, the Mightiest Warrior, and Danu’s Most Fertile Stud. His famous club could kill or resurrect, depending on which end He tapped you with. and a Healer’s Blessing of fertility. of wearing it on a chain or cord. Amulets by Merlin found on the back. You may purchase these amulets through my site.